Annette Lemieux’s chief material is the stuff we make meaning of: symbols, language, objects pulpy with metaphor. In her best work, she distills the sea of meaning we swim through into something new and resonant. “Annette Lemieux: Unfinished Business’’ at the Carpenter Center for the Visual Arts at Harvard University, stems from a studio move the artist made in 2010. 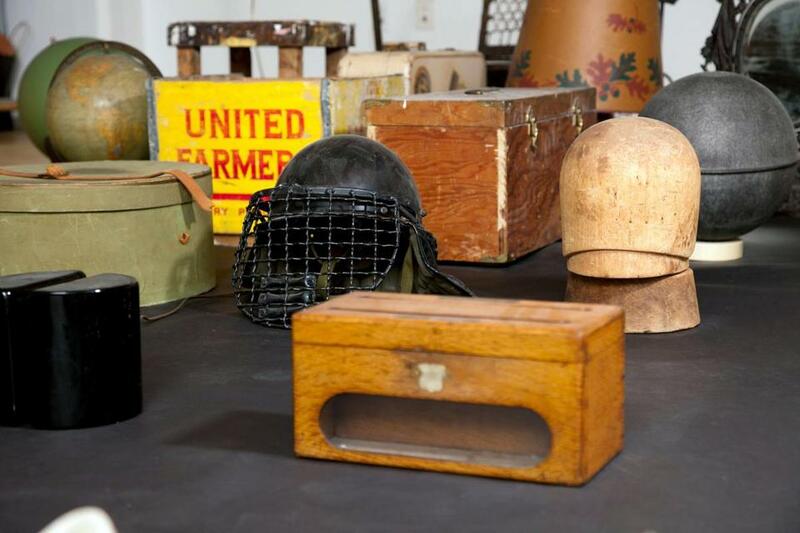 Lemieux found 100 objects that she had collected, or been given, or intended for future works. This exhibit features rediscovered, revised, and new work, all sifting through memory and meaning. The installation “Things to walk away with’’ is the show’s jewel. Writing about it in the exhibition brochure, curator Lelia Amalfitano quotes William Carlos Williams: “No ideas but in things.’’ Lemieux’s things read like lines in a poem, gathering meaning as they accumulate. She has arranged dozens of objects on the floor, echoing the Latin cross layout of Chartres Cathedral, and sorted the objects according to height, from cardboard pieces such as a flattened earmuff box at the base of the configuration, to a flickering chandelier at the top. Along the way there are century-old scrapbooks with handwritten title pages, helmets and maps, an assortment of cloven hooves made into candleholders and lamp bases, and much more. The piece rises, suggesting mounting importance, as if the artist is leading us up a path to awakening, with hints along the way to pry open understanding about the baggage we carry, the equipment we’ll need. “Things to walk away with’’ reads like a hero journey, full of twists and clues, challenge and hope. Lemieux’s series of prints “La Itala Laborposteno (The Italian Job)’’ takes off from Esperanto, designed in the late 19th century to be a language that would foster peace. The artist puts the lie to that enterprise - language is too complex to foster any one particular ideal - by choosing fraught words. The print “Monstro,’’ or monster, is glaring red, with a man peering through a magnifying glass at a tiny globe, his face grossly enlarged. The gutsy sculpture “Back to the Garden’’ links George Orwell’s “Animal Farm,’’ the allegorical polemic against corrupt leadership, to labyrinths, symbols of mysticism and spiritual growth. 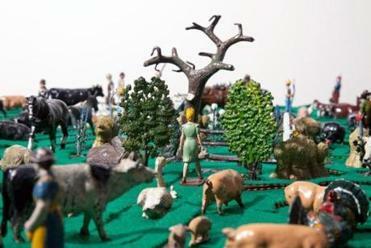 Lemieux achieves this breathtaking conceptual merger with sweet toy animals and farmers ambling through a green maze. In this show, threat always lurks, but so does the possibility of salvation. Art is nothing if not cannibalistic. “Misappropriation’’ at Lot F Gallery, featuring work by Thomas Buildmore and Scott Chasse, suggests with its title an opportunity to judge artists who appropriate others’ images. But that ship has sailed. The exhibit is really a showcase for the artists to glory in the currencies of pop culture, from Angry Birds to Burt Reynolds. The challenge is to make something more of these images, already freighted with iconic meaning. The paintings are fizzy with pop, and those bubbles go easily to the head. Chasse’s paintings of Burt Reynolds offer some substance. In his almost rubber-stamp image of the actor in black and white, Chasse adds subtle color shifts and drips beneath the surface, giving Burt a mood-ring shimmer. Quotes from Reynolds rise and vanish, like ungraspable words of wisdom. But Chasse’s subject is such an object of camp, it’s hard to push images of him beyond that. Buildmore makes snappy paintings. Some, such as “The Garden,’’ pile on so many icons, from Betty Boop to Super Mario mushrooms, that it reads like the half-digested burp of someone who has consumed too much at the pop culture buffet. This technique worked better in wall paintings in the immersive “Paint It Now’’ shows at the Distillery. His other works, such as “Ka-Pow! 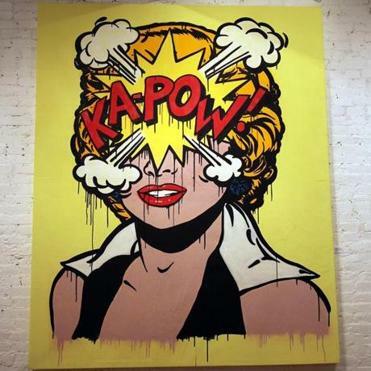 !’’ featuring a cartoon Marilyn Monroe with her head exploding, have more focus. But saying something fresh about Marilyn is not easy, and Buildmore fails at that. There’s fun work in “Misappropriation,’’ but it bounces along on pop culture’s taut surface when it could go deep, or be subversive. LL Milton is an old school abstract painter. Her show at the Gallery at the Piano Factory stirs ghosts of mid-20th-century British artists such as Ben Nicholson and Peter Lanyon, who focused on structure and landscape in their brushy, textural abstract paintings. Milton’s paintings spring from her interest in neglected architecture. Her process involves recycling unsuccessful paintings and drawings into new art. She pays vigilant attention to texture. “Above and Beyond’’ plays glistening etching ink off a rougher oil paint. Its streaks of clotted blue, crusting white, and stretches of blue-green resemble wood grain. Then she collages on painted-over paper. All the shifts dazzle. At the same time, she is trying to create a sense of space, with a loose grid and hammocks of color. But she activates so much intimate attention with her textures that we don’t want to step back, to breathe and perceive structure and space. The paintings are fervent and skilled - there’s a lot of excitement - but Milton needs to balance her fervor with editing. 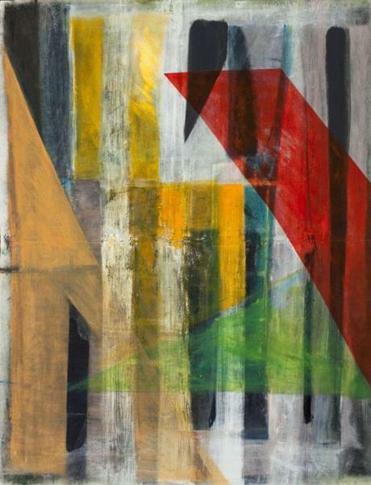 MISAPPROPRIATION: Recent Works by Thomas Buildmore and Scott Chasse At: Lot F Gallery, 145 Pearl St., through March 30. 617-426-1021, www.lotfgallery.com. Open by appointment.